When you look around the horse world, you see this problem of head bobbing a lot! The horse is bobbing his head up and down or throwing it around and it isn’t pretty. (It can’t be a good feel to the horse either.) It’s no wonder though, that so commonly you’ll see all the gimmick bits (Tom thumb etc.) and such out there. It’s almost unbelievable, some of the things I’ve seen or heard about on how to “fix” a head bobbing horse. Use a tie down (If you’ve read any of our other pages, you can guess what I think about that!) Of course they work until you take them off! Train him in restraint rigs. (Draw reins etc.) I actually knew a man when I was young, who would tie the horses head down (way down) and leave them like that saddled for hours. Pretty Sad! There are ways to deal with a head bobbing horse without resorting to abuse or gimmicks. Some things need to be checked first to make sure they’re not the cause. Check or have a vet check your horse’s teeth. A lot of people seem to think it’s just old horses whose teeth need work. They can all have problems – from colts to old times. Sometimes even where they’re raised can cause them mouth/teeth trouble. (We got a load of steers in one time from Western Kansas that had been on very sandy pasture and their teeth showed signs of excessive wear. The sand combined with the short grass wore them down) So check your horses teeth. Also, make sure he’s not lame or in pain in his front end. This can cause a head bobbing problem in horses. Check your riding gear. Some saddles don’t just fit right and can cause problems. Make sure your saddle isn’t too far forward! Don’t use junk bits. I’ve seen a lot of head bobbing horses, or horses throwing their heads due to cheap bits. They tend to pinch the horse – so just a slight signal to slow down or stop can be excruciating for the horse. 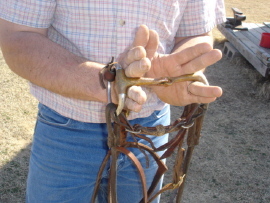 Even when using a soft feel on the reins, the cheap bit (or wrong it) can cause problems. It can take a while to get your horse good about giving his head (being soft) so don’t ruin it by using a wrong or ill fitting bit. Make sure your headstall isn’t bothering him. Believe it or not this can cause you a lot of grief (and head bobbing might be the result). This is one reason why I don’t advise using a fixed-ear headstall. They usually don’t fit well and can put a lot of pressure on the horse’s ear. Personally I like a brow band headstall (with a snaffle bit) provided it’s big enough at the brow band not to be to close to the horse’s eye. All my life I had been told to tighten your headstall so that there would be a few wrinkles at the corners of the horse’s mouth. I’ve also been told if you know the horse is broncy, tighten it up a little more. Talk about wrong! That just scared the horse even more, making the situation worse. I had a fellow, some time ago, talk to me about letting the horse decide where to carry the bit. In other words, adjusting it looser (further down on the bars) so when the colt/horse got used to packing it around he could just keep it where it was most comfortable. He said that it wasn’t a cure-all, but my old ponies would sure appreciate it – They did to. You really need to have a good foundation based on feel in there first though. There are quite a few people out there who spend way too much time in their horse’s mouth. Most of them probably don’t realize it. This is one of the most common causes behind a head bobbing horse. Usually the person either lacks confidence in their riding, or their horse. Maybe they’re riding a jiggy horse and are heavy handed (pulling on them) without realizing that it’s just making it worse. It’s easy to forget what’s going on when you’re pulling on that horses mouth. The amount of force that’s being applied to the corners of the horses mouth or bars/tongue is often a lot higher than what we might think. One little exercise I have people do when I’m trying to drive this point home is as follows. Take the snaffle bit between your fingers, and have someone stand behind you and pull the reins – it’s easy to see when you do this the kind of force or feel your horse is getting. Now imagine in your mouth. Remember, if he won’t do these things on the ground – he won’t do them when you’re on his back. You want to make sure your horse is operating with a soft feel. (Lowering his head/breaking at the poll) when you ask him to back or stop. If you can get this good at the walk, then trot, it will happen at the lope. It’s better to work up then to work back down –believe me. Another thing to help with the head bobbing horse is to make sure when you ask him to tip his nose - he will. Quietly and calmly bringing his head and neck around towards your knee and keep it there until you release. Also make sure he can pick up on your feel to speed up or slow down – again quietly and calmly. If your horse will do these exercises for you (on the ground and on his back) head bobbing isn’t going to become a problem. I was working for a really good trainer when I was younger and learned a little lesson about head bobbing. I had started a little black stud colt and he was coming along really well. As we went on in a bit further in his training, though, we began to have problems. When I would ask him to turn really tight (starting to learn to spin) and put a little effort into it , he would brace against me and push. I finally had the trainers watch me to see what I needed to do. I thought it was the horse’s problem. It was mine though! Instead of setting it up where the horse could do it, I wasn’t getting out of his way. This fellow told me “You need to trust that horse. You’ve put a good foundation in there, so he knows what you’re asking…you just got to let him.” You know, he was right. When I would ask him to come around, I didn’t really release. I was trying to pull him around. If I would’ve continued doing this, I could have possible destroyed that trust the horse had in me as well as the foundation I had put in. That helped me really realize the value in setting things up for the horse to succeed, then getting out of the way and letting them do it. For questions about Head Bobbing in horses, please contact us.